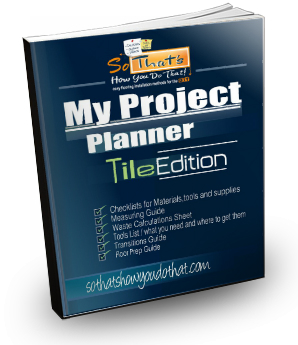 My Project Planner- Tile Edition - So That's How You Do That! can run into during a project. when I'm out there installing? have asked me in the past. This guide will show you everything you need to know about transitions. I explain how to transition to different types of flooring and show you exactly which transition you should be using. I also have clickable links to images of them so you can see what it really looks like. And if you this also the link to where I buy these transitions and where you can also if you choose to do so. I guide you through how to measure your project. We will discuss how to break large areas down for easier estimating. I will also explain how much waste needs to be added to the total. There are drawings that you will see to better show you this process. It is important to make sure your floor is flat before installing tile. So floor prep will be needed to fix these areas. None of the home improvement stores sell a product that I would trust to install tile on top of. The last thing you want is for your tile installation to fail because of a bad product. This Guide will ensure that you do not use the wrong product on you floor and also I share with you the tools that you need for floor prep. This planner has checklists for all the tools, supplies and materials you will need. These checklists have been created with great detail and I didn't miss a thing. Each tool, supplies and materials(excluding your tile of course) has clickable links to the tools I highly recommend. These links are also the same place I get these items and they are available to you. This form has been designed for convenience. You will be able to write all of the tile that you choose in the columns provided. This is really nice for keeping everything organized. It also has sections for multiple rooms for those bigger projects. I have also included sample lists to keep track of samples you get from different stores. I also want to include a special bonus to help with your project even a little more! There are two different forms that go together, the actual budget form and the allocated form. Both of these forms have all the tools, supplies and materials entered. You just fill in the blanks on the items you are going to use. These forms are great for estimating how much your project will cost. Then use the allocated form when you spend the money. where can I buy Hydroban or similar product? Hydroban is sold at any tile store that s3lls laticrete products. Otherwise you can buy it on Amazon. Most of the paintable membranes out there are pretty good, I just prefer hydroban and think it’s the best. Is there a problem if i leave 1/2 inch from backerboard to bathtub edge? My measurements werent that perfect and in some seems i got barely 1/8 inch,,, what do you think? I would tape it with fiberglass mesh tape and fill it with thin set. Need help on tiling a wall with mosiac that the ceiling is angled at the top if possible??? I have a great video that shows how to tile a ceiling in Tile University.